Time management is one of those important skills that I think we all need to learn. As a stay at home mom (future homeschooling mom for a little while and aspiring work at home mom), time management is one of those things that I really do need to get a grasp of. 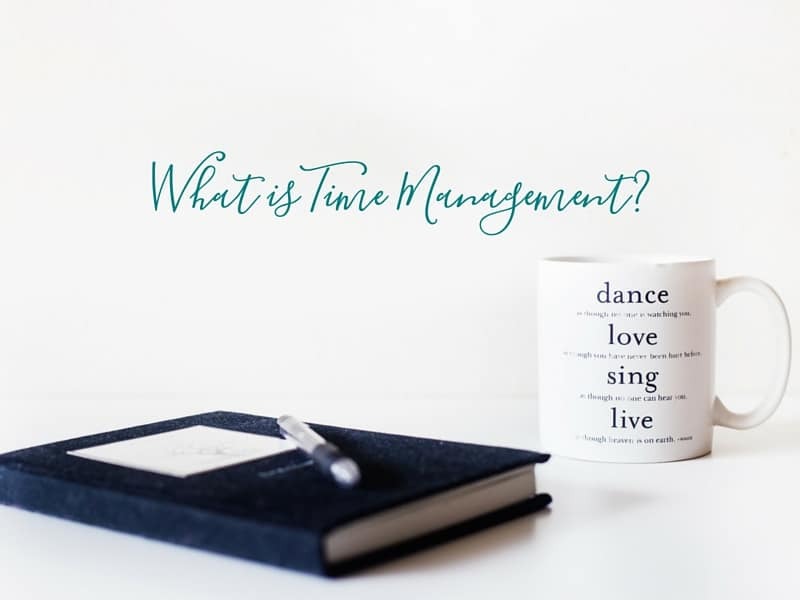 Most of the time I think I do okay in this area, but for all that we’ve talked about it before… What is time management? If we don’t really know what time management is, then those time management tips and being mindful about time management might not do us too much good. Basic time management is setting up goals and plans that are reachable. Even when we set up our time management plan, we should make it realistic. When setting goals for ourselves we should ask…Is this goal reachable? Can I achieve this goal? What do I do to make this goal successful? You’ve probably heard the acronym, SMART; Specific, Manageable, Attainable, Realistic Timely when it comes to setting goals. This is also an ideal way to create a time management system for your work or personal life. Or you can use these criteria to evaluate a time management and day planner system that you might purchase. Specific: Your time management system must be able to record each task and have enough room to add necessary details. That’s why those small, freebie calendars that you get from local businesses doesn’t have enough space to be specific about your tasks and what’s needed to accomplish them. Manageable: Some time management systems can be so detailed and complex that using them is a part time job. That’s not helpful and can discourage you from doing any type of scheduling. If one system does not work for you, find a different one, but don’t give up. And don’t get a planner book that’s too large to comfortable carry with you when you are out of the office. That leads to the sticky notes scattered around and missing important appointments. Attainable: Yes, you can get your frantic, over-booked life under control. In fact, you have to do it for your health as well as for your business. Why add needless stress to your workday by trying to remember your schedule instead of planning it on your calendar. You can complete more work in less time if you have a big picture of the tasks and prioritize those tasks each day. Realistic: No matter how you try to stretch it, there’s still only 24 hours in a day. If you work 8 hours, travel 1 hour, sleep 7 hours, then you have 8 hours remaining to get dressed, eat meals, spend time with your friends and family, exercise and socialize. Timely: Time does not stop for any of us. When you take on too many tasks for the allotted time, you know how it feels as if time is moving in hyper-speed. The purpose of time management is so that you can accomplish what you need to do and balance each deadline with other work plus those unexpected interruptions. Asking yourself the right questions is one basic element of developing a time management routine that works for you. Another basic element in time management is asking for help. That is a plan that helps to lead you to success. We can’t know everything, or do everything, so sometimes you have to ask for help. When you are asking questions, you are letting others know that you are seeking a solution to a problem, or attempting to reach a goal that you have set. By asking yourself and other questions, you are relying on your own fortitude, and trusting others. When setting goals, you should scrutinize carefully which strategies might work most effectively to reach that goal. You will want a plan that is logical and uncomplicated, but that takes into account that there might be setbacks along the way. Since no plan is perfect, keep in mind when you are creating a plan for time management that things could go wrong, so that you are not thrown off when there is a crisis. Life is too short to waste time on not getting the job done, and time is money. Learning how to manage your time effectively will help you to reach all of your goals. Everything is at the mercy of time. There is no getting around it. Learning how to manage what we can control is the best way to achieve goals with less stress. Time management, with SMART goal planning, can make a world of difference. Once we’re able to prioritize our goals, life will be easier. What goals have you set for yourself and are they SMART goals?